https://kaslojazzfest.com/wp-content/uploads/2019/03/KJEF_lineup_inital_relase_web_only-1.jpg 1447 936 Kaslo Jazz Etc Society https://kaslojazzfest.com/wp-content/uploads/2018/08/KJEF_2019_website_logo-black.png Kaslo Jazz Etc Society2019-03-05 12:57:172019-03-05 13:01:522019 Initial Artist Announcement! https://kaslojazzfest.com/wp-content/uploads/2018/08/Thank-you.jpg 1080 1080 Kaslo Jazz Etc Society https://kaslojazzfest.com/wp-content/uploads/2018/08/KJEF_2019_website_logo-black.png Kaslo Jazz Etc Society2018-08-20 10:50:372018-08-20 10:50:37THANK YOU! 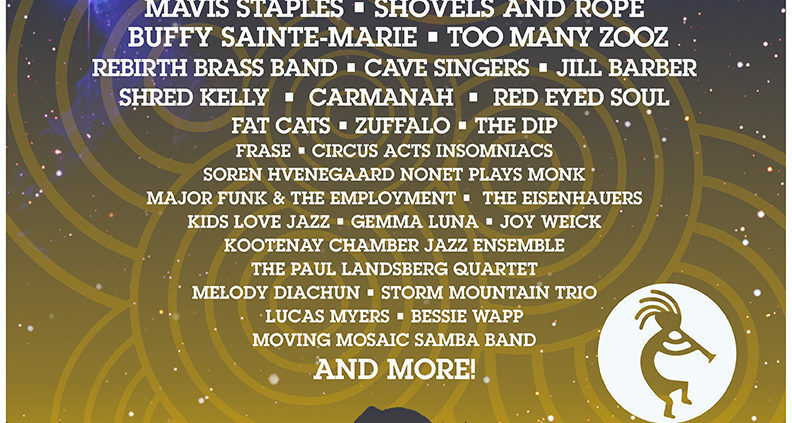 https://kaslojazzfest.com/wp-content/uploads/2018/04/Camping-On-Sale.jpg 3630 4615 Kaslo Jazz Etc Society https://kaslojazzfest.com/wp-content/uploads/2018/08/KJEF_2019_website_logo-black.png Kaslo Jazz Etc Society2018-04-10 17:11:392018-04-10 17:11:392018 Camping Passes On-Sale! https://kaslojazzfest.com/wp-content/uploads/2018/02/KJEF_2018_Initial.jpg 5100 3300 Kaslo Jazz Etc Society https://kaslojazzfest.com/wp-content/uploads/2018/08/KJEF_2019_website_logo-black.png Kaslo Jazz Etc Society2018-02-15 12:15:232018-02-15 12:15:232018 Initial Artist Announcement! 2017 Schedule and Single Day tickets available NOW! https://kaslojazzfest.com/wp-content/uploads/2017/05/KJEF_2017_schedule_1_edit.png 1080 1920 Kaslo Jazz Etc Society https://kaslojazzfest.com/wp-content/uploads/2018/08/KJEF_2019_website_logo-black.png Kaslo Jazz Etc Society2017-05-29 16:45:592017-05-29 16:45:592017 Schedule and Single Day tickets available NOW!